A good study plan is crucial for passing the SAT or ACT. 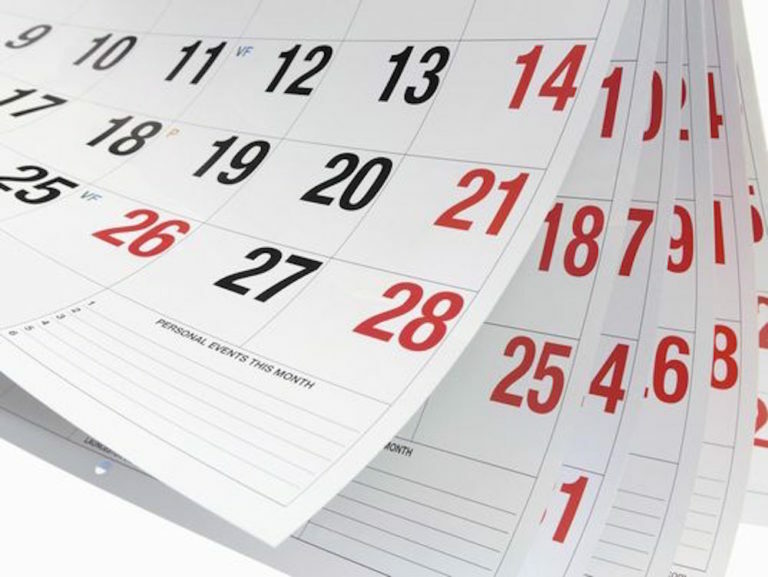 To plan well, it’s good to know the SAT test dates and ACT test dates. And of course, a number of other factors–and study materials–go into creating your perfect SAT/ACT prep calendar. One positive change regarding the tests is that the test dates are not as spread out as they used to be. With that in mind, there are still some months with no SAT test dates, so you still need to think very carefully about when you take the test. The same is true for the ACT. Like the SAT, the ACT is only offered on very specific days and it is not available every month. Another thing the ACT has in common with the SAT is that it’s administered only on Saturdays, with calendar dates for the test that vary from year-to-year. And if that’s not enough, one more thing to be mindful of is the registration deadlines for the exam you’ll take. You can’t just register for the SAT or ACT the day before you’ll take your test. Missed registration dates are another common reason that students aren’t able to test on their ideal day and make their perfect study plan. Fortunately, there are ways to keep track of all of the relevant dates for taking the SAT and ACT at the right time. There’s a great online resource for SAT test dates, complete with upcoming test dates, registration dates, and dates that scores are released. And there’s a similar portal on the web for ACT test dates. *The late registration date is one week earlier if you are registering by mail. Although the College Board has confirmed SAT test dates for 2019-20, it has yet to confirm SAT registration and score release dates. The SAT registration and score release dates in the chart above are estimates based Magoosh.com’s analysis of the patterns of previous testing years. 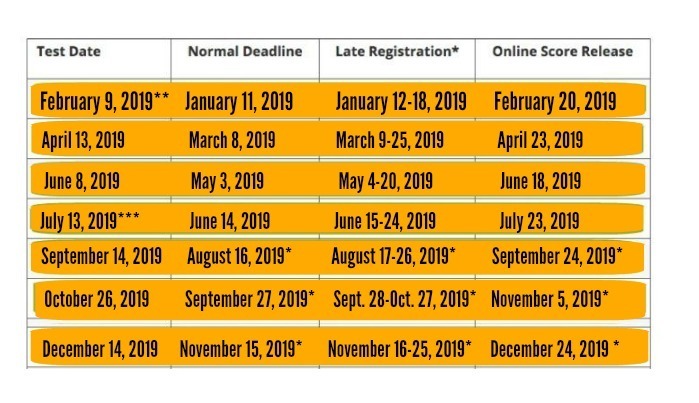 Here are the anticipated test dates, registration deadlines, and score release dates for 2019. The test dates are confirmed by ACT, Inc., the others are our projections based on historical data. *The first date is when multiple-choice scores come out; the second date is when complete scores (with the Writing section) come out. **Test date excludes New York and international locations. Of course, there’s more to setting the right test date than just knowing the days of registry, testing, and score reporting. You also need to figure out exactly how much time you need to prepare for the test. The study plans that students put together vary in length and depend at least partly on an individual student’s learning needs and time constraints. That being said, a typical high school student can usually become fully prepared for the SAT or ACT in about a month. On average, SAT and ACT preppers will need around 6-12 hours of study time per week. This study can be done on as little as three days a week, or it can be stretched across every weekday. Some students even do their one month test prep plan by studying one or two hours a day, five to seven days a week. The key to a good study plan is practice, practice, practice. So the trick is to find enough prep materials for a month’s worth of mock exams and other practice exercises. Official SAT practice from the College Board and similar official ACT preparation are a must-have. But there are other good third-party materials as well. Gleaning tips from an ACT test-prep expert in addition to taking suggestions from an SAT test-prep master couldn’t hurt. Again, the Internet is your friend as you try to figure out your study schedule timelines, weekly activities, and materials. Here’s a good page to see what a typical one month SAT study schedule looks like. And here’s a good example of a one month ACT study schedule. David is a test prep expert at Magoosh. He has a Bachelor of Social Work from the University of Wisconsin-Eau Claire and a Masters in Teaching English to Speakers of other Languages from the University of Wisconsin-River Falls. He has been teaching K-12, University, and adult education classes since 2007 and has worked with students from every continent.